is not only spectacular looking - it is surprisingly easy since it is made in the hoop. Blocks are totally pieced in the hoop, joined in the hoop and quilted in the hoop. Click here If you are looking Machine Files and Layouts for a Table or Bed Runner. Click here if you are looking for Layouts for Table and Bed Runners. Click here if you are looking for for Full Quilt Sized Layouts. Cutting Templates are available separately. Click here to read more. Click to watch the Continuous Backing and Batting Video. Double Wedding Star is a De-Constructed design and assembled in Columns for larger blocks and easy construction. The hoop size that you select will be the size of of one quarter of the block design. Machine instructions for 5 and 8 inch hoops with rings that finish at 10 and 15 inches. 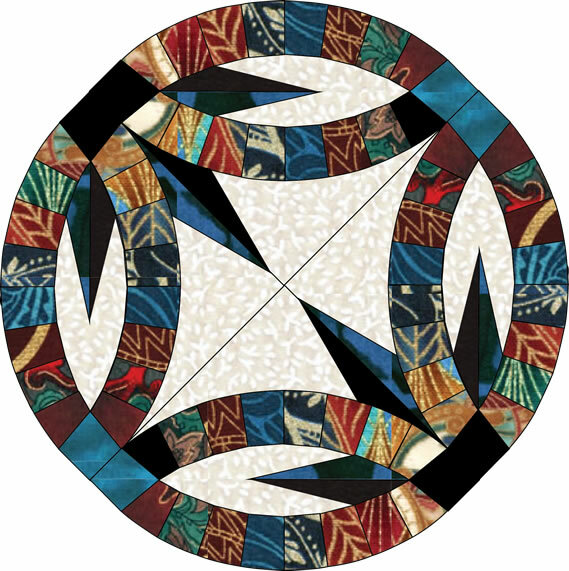 Interchangeable Quilt only designs for plain or unpieced 5,and 8 inch blocks. Available for instant download for 5 and 8 inch hoops.